First of the spring wild Oregon salmon. 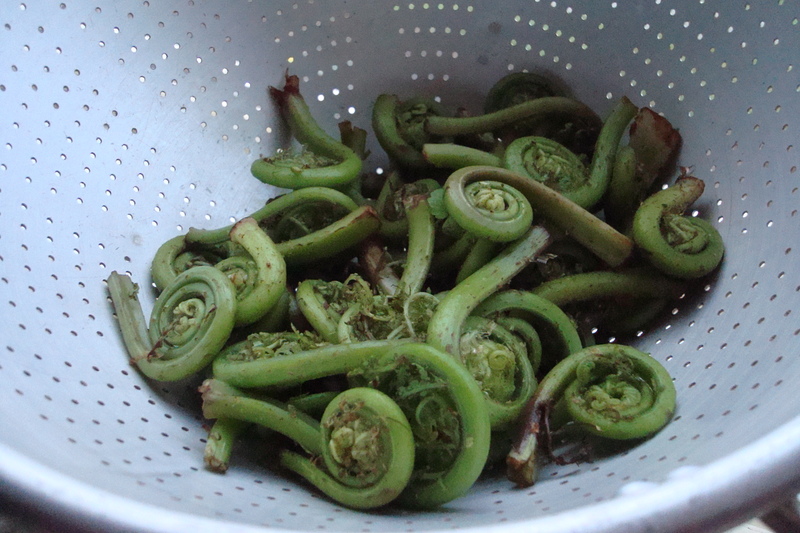 Fiddlehead ferns fresh at the Hillsdale Farmer's Market in Portland. No energy to write now, as I’m still recovering from an early a.m. flight back from my first (and likely last) trip to Vegas. Somehow a meal of foraged and native Oregon ingredients seemed the perfect antidote to Sin City’s tawdriness. So I mustered all the strength I had to get to the Hillsdale Farmers’ Market after the flight landed in Portland. Friend Rebecka from Gathering Together Farm was there and co-host Miriam met me at the market, there in her neighborhood. 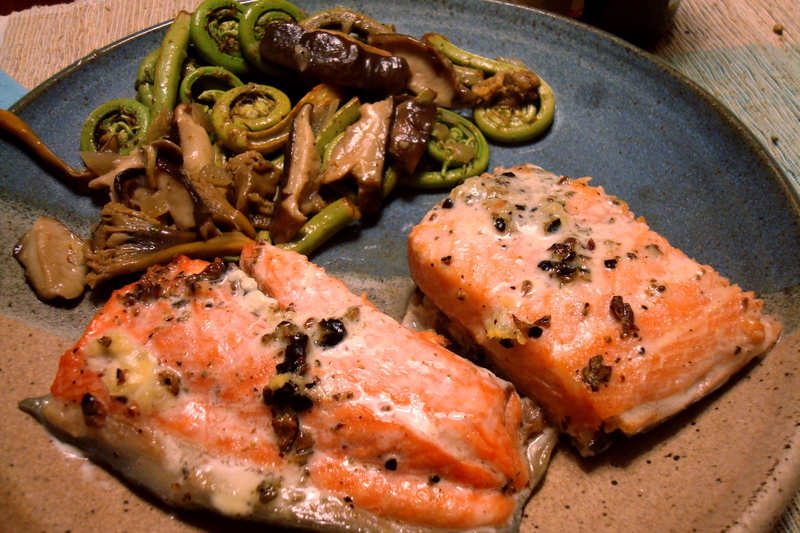 The fiery coral, first-of-spring salmon called to me, and the freshly foraged fiddlehead ferns and mushrooms. The salmon I rubbed with cracked juniper berries (listening to The Splendid Table inspired me), and then sealed with creme fraiche a la Molly Wizenberg. For the side dish, I sauteed delicate yellow foot winter chanterelle and shitake mushrooms in my home-cured guanicale with onions and garlic, then added the blanched ferns. A simple antidote to a place of excess. Something about being in Vegas makes one want to fast, maybe with one of those lemon juice cleanses. We’ll see if I have the will-power.